It's the sixth town hall the mayor's hosted, a practice he started last fall. 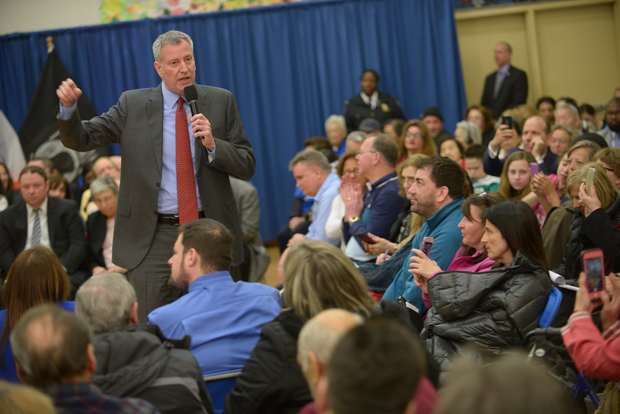 BAYSIDE — Mayor Bill de Blasio fielded questions from Queens residents Monday night on everything from airplane noise to City Council pay raises. The town hall meeting was the sixth the mayor's held in neighborhoods across the city in five months in an effort to get his message to New Yorkers more directly. Monday's event, co-hosted by City Councilman Paul Vallone at the Selfhelp Center on 26th Avenue, was dominated by questions from members of the many civic groups in College Point, Bayside and Whitestone. It took nearly an hour for questions to begin, after de Blasio introduced each of the city's commissioners and ran through a checklist of what he's accomplished, from universal pre-k to Vision Zero. There were questions about property taxes on co-ops and condos, about the proliferation of "McMansions" and whether there would be an increase in vocational training for District 75 students. Alfredo Centola, president of We Love Whitestone Civic Association, asked, among other things, about the recent City Council raises approved by the mayor. De Blasio said City Council members such as Vallone don't work "a typical 9 to 5, to say the least," and each member has an obligation to more than 100,000 residents. "I think what was put through, which I signed, was fair," he said. Many of the questions were deferred to the commissioners in attendance, especially concerns about traffic lights, parks and senior issues. 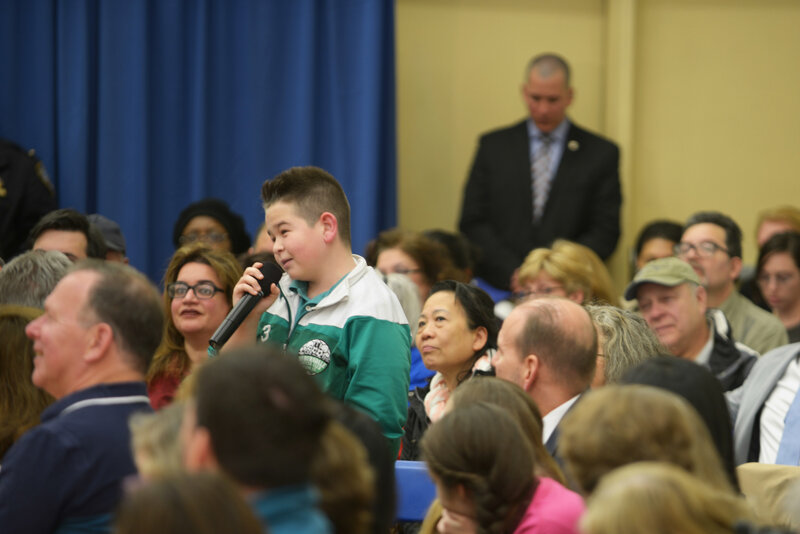 Elementary school student Angelo Coniglio, dressed in his green Auburndale Soccer Club zip up, asked the mayor about the College Point Sports Complex. "Like, will there be any plans for it? Because I think we need a soccer field," he said. Parks Commissioner Mitchell Silver spoke up. A brand-new soccer field was planned for Little Bay Park and there were plans for soccer and football fields at College Point, although the funding wasn't all there yet. "Good news is coming," he said. Susan Carroll and Janet McEneaney both asked questions about plane noise, which has plagued the neighborhood and others in Queens for years. "I don't like it when a community feels afflicted by noise, especially when there's any other alternative," de Blasio said. He didn't have a specific answer, although he said he was encouraged by recent restrictions made for tourist helicopters. The mayor, as he's done in his other town halls, readily admitted when he didn't have an answer to a question. When asked by a construction worker if he planned to use union labor for his new affordable housing plan, de Blasio said he'd like to try. But he didn't make any promises. "If we don't create a lot more affordable housing a huge number of people will be forced out, so we gotta solve that problem," he said. "I think there is a way to do it with union labor if we find a creative way together."